Today we have a fun new 3D music video from Detroit, Lord Scrummage's "Lake Cheese". The video tells a story that is based off of the life of Moondog, a blind American composer who lived on the streets for much of his life. The "Moondog" character has his song stolen by an impostor "Moondog," and the song becomes a success. The song is both lyrically and musically inspired by Moondog and his life experience and the song includes a saxophone melody that was sampled from his song "Paris." Filmed by Giant Eel Productions, directed by Jacob Hurwitz-Goodman. Rounding out our week of 3D music videos is Aisack's upbeat "Piquito", directed by Guido Gutiérrez, produced by TV3D.cl. This is the first reggaeton 3D music video from Chile. The video for this catchy tune comes packed with gratuitous shots of bikini-clad ladies encircling Aisack as he performs at a sunny pool party. Another 3D music video was released this week, this time hailing from Germany's punk rock band SERUM 114. Band members Esche, Thorsten, Nils, and Markus teamed up with students at the University of Darmstadt's Department of Media Direction to produce "Wenn wir Abschied nehmen" (aka "When We Say Goodbye"), what they claim is the first German 3D music video. You can watch more of their music videos on their YouTube channel. This week we have another new 3D music video, "Two Funky Two" by DSR aka Deyn S & Rhythmic, a new Dance/Urban group based in Bristol, UK. The video follows Deyn S and Rhythmic as they go to a club, Rhythmic puts the moves on a woman, and gets involved in a very complicated sting operation. It was shot with the Panasonic AG-3DA1 by The Digital Film Company, directed by Andrew Dymond, produced by Jonathan G Brown and Lightworx Media Ltd, with camera/stereography by Neil Richards. Most of the shots were composed with a generous, natural-looking amount of volume to the 3D, but the video suffers from a few gimmicky in-your-face effects. Today we have a new music video, "Get Up" by Child Actor. This video makes creative use of lighting with video projection and shadows to tease our perception of depth, creating a trippy effect where fragments of dancers and guitars flicker and float out of the screen. I hope to see this style explored more in stereo. "Child Actor is a collaboration between cousins Sedgie Ogilvy and Max Heath. Together they create densely layered and openly emotional music manipulating touchstones of R&B, hip-hop, pop and indie rock. Their first EP, Partner, was released in February 2012 and their Fake Four debut, tentatively titled Victory, is set to arrive this fall." 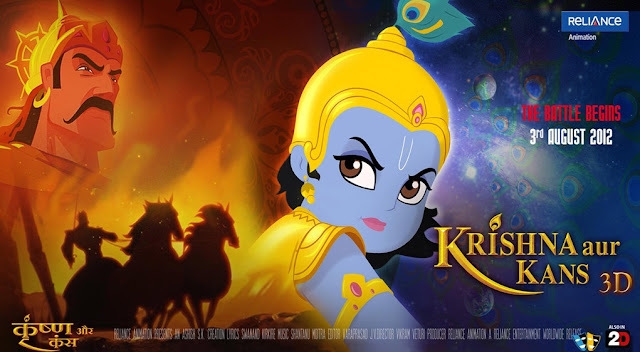 News of an Indian stereoscopic 3D animated movie, "Hey Krishna" (Krishna aur Kans), produced by Reliance Animation, converted by Reliance Media Works and distributed by Reliance BIG Entertainment, recently hit the Internet. It's impossible to judge how good the 3D will be from this 2D trailer, but the impressive 2D animation will hopefully translate to a high quality stereoscopic version. The film has been dubbed India's first stereoscopic 3D animated film (apparently oblivious to Alpha and Omega). "Hey Krishna" is scheduled for release August 3rd. It was written by Kamlesh Pandey, directed by Vikram Veturi. It stars Om Puri, Juhi Chawla, Manoj Bajpai, Anupam Kher, Sachin Pilgaonkar, Supriya Pilgaonkar, and A.K. Hangal. More info can be found on their Facebook page. Hopefully this Indian film will make it to the US, instead of cheap Disney/Pixar knockoffs like Kiara the Brave, which is now on Netflix and is even worse than it sounds. Today brings a 3D music video from Russia, the upbeat disco tune "ASSOL" (АССОЛЬ), composed and filmed by Igor Darouv, from his album "My Mirage".
" 'My Mirage' is tomorrow's reality, which is based out of our hopes, dreams and optimism today. This legend of our ancestors, who kept faith in the victory of light over darkness and gloom, it is the triumph of redeeming love for all time!" While the 3D is decent, the video suffers from an unfortunately common problem with stereoscopic content: pretty shots with no story. It might make more sense if you can understand Russian. The weekend brings with it more opportunities for viewing NSFW content without getting yourself fired, and today we found a trailer for Australia's first 3D adult movie, Love Thy Neighbour 3D from Popporn 3D Productions. "Sydney is home to millions of Australians, surrounded by sunny beaches, iconic architecture and beautiful women. Any cobber who lives next door to some of these fair dinkum aussie babes would take a litteral wish, to love thy neighbour! So come on in and join our neighbours, Kiki, Samm, Bella, Jayden, Kendelle and Mishka, as they take you to a whole new level in 3D High Definition - where there is no place like home!" Starring Kiki Vids, Jayden Paris, Bella Maree, Samm Rosee, Kendelle Rose, and Mishka Venter, and probably some guys. The region-free 3D Blu-ray can be ordered through their website for $69 $39. Today I was pleasantly surprised when I stumbled upon Platform 2c, a UK-based 3D soap opera webseries produced by NFD Productions and directed by Richard Connew. While the performances and the production value vary from episode to episode, it is admirable to see people dedicated to producing a steady stream of 3D web content. You can find episodes from all four series on their YouTube channel. "Platform 2c is a weekly quirky eclectic soap opera whose story takes place connected to and around people who use and live near Platform 2cin the Yorkshire village of Milford. Platform 2c is unique in that all episodes are produced in 2D and digital 3D versions. Our first episode went live Sunday August 28th 2011 and we have been producing one ever since. Our format is a mini episode of around 3 mins each week ten of which go to make up a series of around 25/30 mins total playing time which equates to a standard TV soap opera episode. This will develop over time into a daily soap opera. Platform 2c is entirely non profit making and self funded with everyone involved putting in their time for free." Today's 3D short is an installation piece from Stephen Lance, Taxi Films, and Holly Ryan. Award-wining director Stephen Lance of Taxi Films has collaborated with jeweller Holly Ryan to create an immersive, 3D video installation for the fifth edition of exhibition series, Seven With Another. An annual art exhibition held at Brisbane Powerhouse, the project pairs talented creatives to collaborate across diverse disciplines. Cutting Edge was invited along for the ride to deliver a stunning hybrid of futuristic VFX imagery in Stereoscopic 3D to be viewed with anaglph glasses. Inspired by the sci-fi stylings of the film Fifth Element, Armour & Androgygecreates a space where body and adornment collide. The world exists as a bleak projection of the future, a highway underpass in striking black and white. The androgyne prepares for something important, reaching for pieces of tribal armour, jewellery used to adorn and bind them for battle. Director: Stephen Lance, Taxi Films & Holly Ryan. For more information, check out this interview with Stephen Lance & Holly Ryan. Today we have a new short produced at the DAVE School, this one's another Star Wars fan film. "Star Wars: Droids 3D" follows 3CPO and R2D2 in an adventure with some mischeivous Jawas, with a nice twist at the end. More info about the DAVE School is available on their website.